Shop online for over 200 miniatronics model trains at discounts up to 46%. Lighting / Electrical is the most popular of the 6 miniatronics model trains categories, then Roadway, and Buildings. This is the Old Fashioned Green & White Lamp Shade w/Bulb pkg(3) in O-Scale by Miniatronics Corp. This is the 16V 800mA Plug-In Wall Transformers (For Use w/Lighting Accessories Only) by Miniatronics. 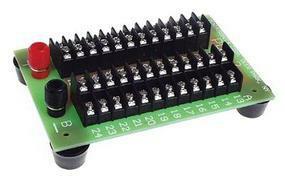 This is the 12-Position Prewired Power Distribution Block by Miniatronics Corp. Rated at 15 Amps. This is the 24-Position Prewired Power Distribution Block by Miniatronics Corp. Rated at 15 Amps. This is the Electrical Accessories Terminal Block 4 Screw (3) from Miniatronics Corp. This is the 2 Pin Micro Mini Connector w/12'' Wire (2) by Miniatronics Corp. This is the SPDT 5amp 120v Center Off-Momentary-Spring Return-Both Sides Miniature Toggle Switch (2) by Miniatronics Corp. This is the Simulated Fire & Flame Light from Miniatronics Corp. This is the Arc Welding Light from Miniatronics Corp. This is the HO Scale SPST Miniature Toggle Switches On-Off from Miniatronics Corp. 5amp 120VAC/28VDC (4). 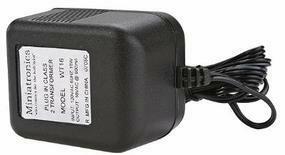 This is the Plug In Wall Transformer, Regulated 12v DC 1amp from Miniatronics Corp. This is the 4 Pin Micro Mini Connector w/12'' Wire by Miniatronics Corp. This is the Rosin Core Solder 4oz. 60/40 from Miniatronics Corp. This is the Miniature Toggle Switches DPDT 5Amp 120V pkg(8) by Miniatronics Corp. This is the Miniature Toggle Switches SPDT 5Amp 120V pkg(8) from Miniatronics Corp. 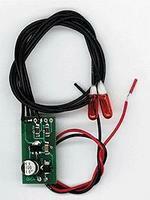 This is the Caboose Interior Lighting Kit For DC or DCC by Miniatronics Corp. For N & HO Scale. This is the Electrical Accessories Terminal Block 10 Screw Double Row from Miniatronics Corp. 4-1/2 x 7/8'' 11.2 x 2.1cm pkg(3). This is the 1.5mm Dia. LED (6ea) Red, Green, Yellow (18) from Miniatronics Corp. This is the Miniature Toggle Switches SPDT 5Amp 120V Momentary pkg(5) by Miniatronics Corp. This is the Electronics and Accessories Catalog 2011/2012 from Miniatronics Corp.